Two simple words calculated to strike fear and trepidation in the hearts of corrupt politicians throughout the fair city of Sunbury, as we continue to expose to the full glare of publicity the events surrounding City Hall. We are certainly not in the business of civic spin doctoring – the editor and his staff at the Daily Item are more than capable of pulling the wool over the eyes of the local populace without any assistance from us. The new Persing Administration wasted no time in signaling its intent to emulate its predecessor, with scant regard for what could be considered to be the best interests of our community and, in doing so, displaying exactly the same penchant for incompetence, stupidity and corruption. It began on election night with Persing’s notorious “taking out the garbage” victory speech during which, sounding more like North Korean leader Kim Jong-un than the Mayor of Sunbury, he crudely threatened the very foundations of local democracy by stating his intent to remove any and all opposition to his evil regime. Even before they officially take office, they have succeeded in passing, without giving any opportunity for public comment, an illegal budget for 2014 – a budget opposed by both departing councilmen, Joe Bartello and Todd Snyder. No cuts were made in areas of obvious extravagance such as Jim Eister’s $500,000 nest egg for Parks & Recreation. Nor were any attempts made to improve the woeful inefficiencies afflicting all departments in City Hall. Persing also failed miserably to fulfill his election promises to protect our citizens by strengthening the city police department. However, despite their claimed lack of money, it was still possible for them to scrape together sufficient green backs to fund a 2% raise for city workers. Persing, aided and abetted by the unelected SEDA-COG, would seem to share with them a mutual interest in systematically destroying the city tax base. Numerous viable houses are being demolished under the pretense of blight removal. Fewer houses mean lower city wealth and lower city income. The CDBG Grants which depend on poverty levels, and which he would rapidly lose were the City ever to turn the corner and move towards prosperity, provide a major source of funding for the Mayor’s burgeoning softball business, allowing for the provision of ever more softball facilities. SEDA-Cog too earn generous commission on every grant they obtain. Local bookmakers are refusing to accept any further bets on the identity of the 5th member of the City Council, the person who will be appointed this month to replace Kevin Troup. Elizabeth Kremer is thought to have been promised the job months ago, as part of the horse trading which took place when Kevin decided he wanted her job as City Treasurer, along with the nice fat office manager’s salary which goes with it. Being elevated to Financial Director will also make Kremer deputy mayor, and in a strong position to fight it out with Jim Eister for the top job, whenever Dear Leader decides the time is ripe for him to enhance his own career elsewhere. Such shenanigans would never take place in a real democracy. The plan would have been made public long ago, enabling the election of 3 new city members in November rather than 2. However, that is not the way things are done in Sunbury. Councilman elect, Dale Henry, is poised to take over Kevin Troup’s old job as Director of Public Works. Troup will not be a hard act to follow. All Henry needs do in order to earn his place in local folklore is insure that the city streets are regularly swept – something which has not happened here for a very long time. Message for Kevin Troup – There is Snow in Sunbury! Meantime, in a parting shot, Troup was threatening city residents with $300 fines, should they dare to toss any snow onto his streets. All well and good Kevin, but before you can fine people for throwing snow on the streets, you have first to clear them. Going by the evidence of the snowstorm on Thursday night, even the simple task of snow removal seems to be above and beyond the limited capabilities of your Department. 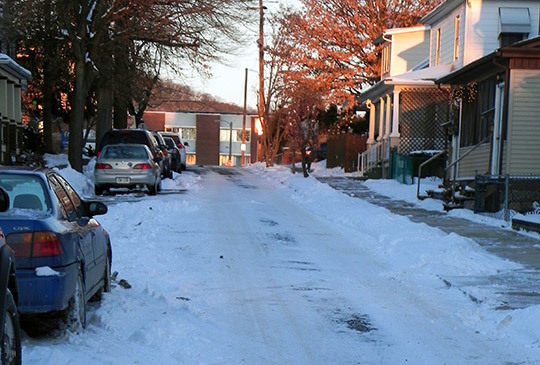 The excuse being bandied around Friday was that it was “too cold” to clear the roads! We wonder how they manage to do it in Canada, or even Minnesota, both places very much colder than Sunbury. However, one local resident was more than happy with snow clearing operations. Miraculously, the cold weather did not prevent the almost complete removal of snow in North 8th Street – at least in one block of it. Cleanest streets in Sunbury by far were at the front and rear of the Persing Pagoda, as city workers strived manfully to show their appreciation for their new raise. 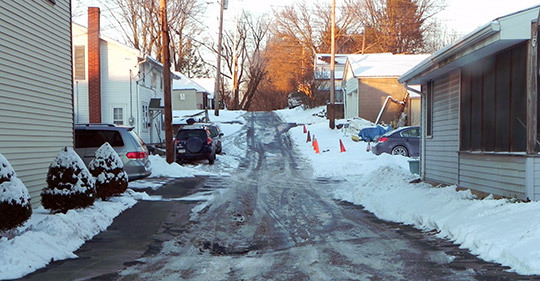 One has only to compare the near pristine state of the Mayor’s back alley to the untreated icy conditions on N 12th St., an emergency access route to the hospital, to see just how skewed our city priorities really have become.